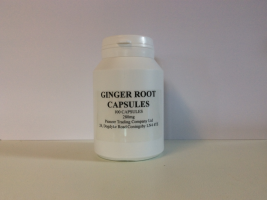 Ginger has become popular as a supplement for helping maintain health joints along side Glucosamine. It is vey well known to aid digestion and its warming properties mean it has a settling effect on the system, take 1 or 2 capsules before meals. Ginger also helps with travel sickness, take 1 or 2 prior to travelling to ease discomfort. Each capsule contains 280mg of ground Ginger Root. Special introductory price £6.95 per 100 capsules.